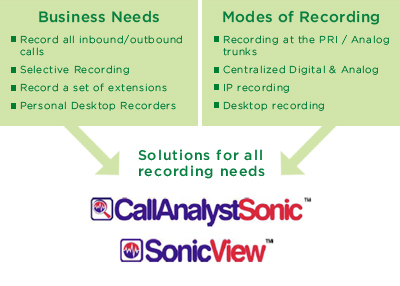 TriVium’s Call Recording and Advanced Call Reporting solutions help organizations maximize the value of voice and data convergence. Technological advances now allow organizations to keep track of and record information about calls, allowing companies everywhere to experience reduced costs, improved productivity, and increased revenue. Where once only large enterprises could afford the luxury of call recording and accounting software, TriVium’s scalable and affordable solutions allow small to medium sized and multi-location businesses to now reap the benefits of streamlined and improved telephony communication.